I have always wanted to be a princess for Halloween but never got the chance. Now that I am 20 years old, I thought it would be silly but turns out it was the best idea yet. Since Princess Jasmine is my favorite and I have the looks, I figured that would be my best bet. At first I was going to buy the costume, but I couldn’t find one that was truly me. 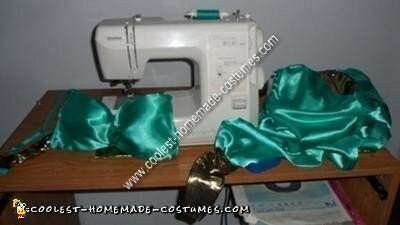 So I went to JoAnnes and got some fabric, I have a sewing machine at my house since I like to alter my clothing. Since I am not as good at sewing as I wish I was, I decided to make the pants by attaching them by underwear shorts that I had. The design is very simple and just right for my complexion. For the top, I sewed the fabric straight on the bra, and put little rhinestones on the folds that I made in the middle of the top. I also made a gold hair band out of the same fabric as the belt and the back of the bra. I feel that my Homemade Princess Jasmine Halloween Costume Idea turned out great and suits me very well.